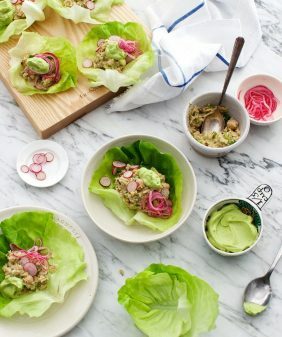 Chickpea Radicchio Wraps - a healthy lunch or plant-based appetizer. 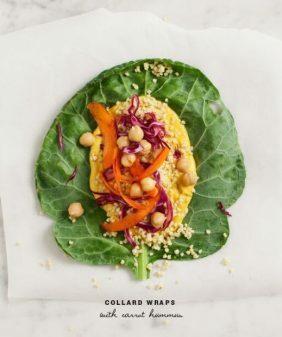 These wraps are filled with chickpeas and drizzled with basil-oil. Vegan and Gluten Free. I just can’t get enough of non-bread wrappy things lately, so I was very excited when this cute little radicchio head showed up in my vegetable delivery box last week. Not that there’s anything wrong with bread, (and I did eat cake for breakfast this morning), but I’m trying to eat a bit lighter overall. And I just love the crunch of these crisp radicchio leaves. Do you all get a CSA box? If you don’t, I highly recommend subscribing to one. I’m not going to lie, it can be a little overwhelming. You’ll ask “what the heck is kohlrabi and what do I even do with it.” But you’ll figure out how to be resourceful and cook with what you have around, rather than heading to the store for exact ingredients for an exact recipe. And yes, I could have picked up radicchio at the store, but I wouldn’t have thought to make these little cuties had one not shown up at my door. Find one in your area here. (I personally get Farmhouse Delivery in Austin. Other good choices in this area are Greenling and Johnsons Backyard Garden). Mix all chickpea ingredients together & coarsely mash. Set aside in the fridge for 15-30 minutes (or make a day ahead). Taste & adjust seasonings. 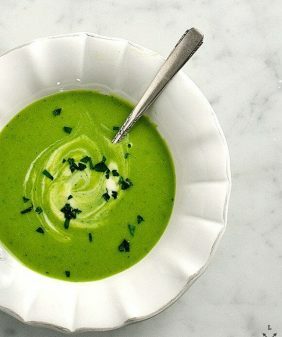 Make the basil-parsley oil by pulsing all ingredients together in a food processor. Taste & adjust. 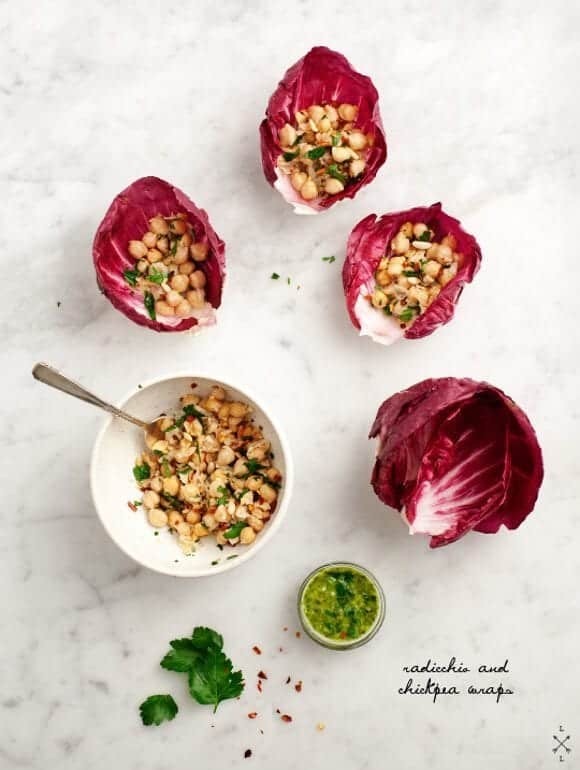 Spoon chickpea mix into radicchio cups and top with a little basil-parsley oil. Such pretty little wraps. I used to think radicchio too bitter but I think I’ve matured a bit because now I love it’s sharp edge. The combination of it all sounds perfect. Thanks Ashley! That means a lot to me coming from you! I am all about snacks and wraps like this! I’m not sure I’ve had radicchio before. I’ll have to give it a try. I love using butter lettuce and chard! I love this! 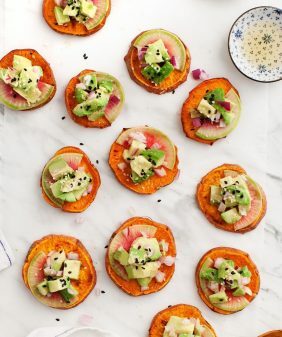 I’m always looking for healthy lunch idea to take to the office aside from the usual salad and this will be great. Awesome as usual! Ohh those little leaves are too beautiful! I have been researching CSAs but can’t seem to find the right fit just yet! And recommendations when looking for one? Have you been to localharvest.org? Otherwise, I would just ask around at your local farmers market. CSA subscription definitely brings out the creativity, especially with the loads and loads of the same stuff that seems to keep showing up (in my situation it’s PILES of beets). Love these sweet little wraps. 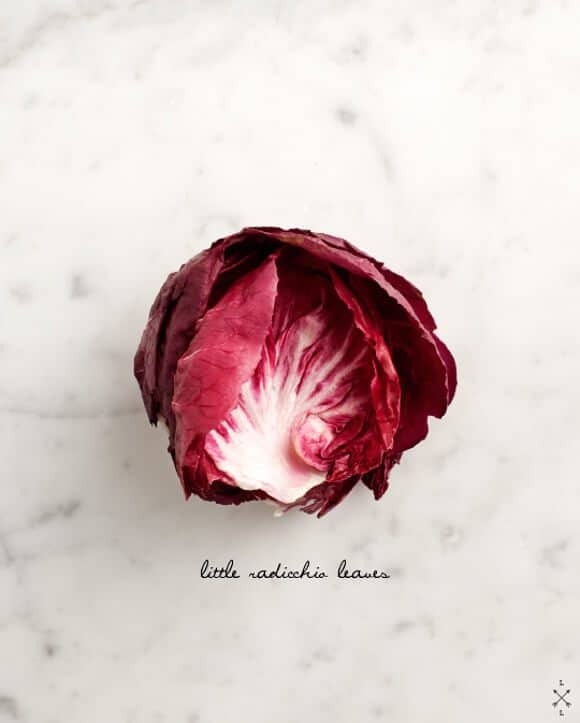 Radicchio is one of my favorite things. Enjoying the bitterness makes me feel super adult. Oh, yum – these look too good. Brilliant use for radicchio, which I never know what to do with when it shows up in my CSA box. 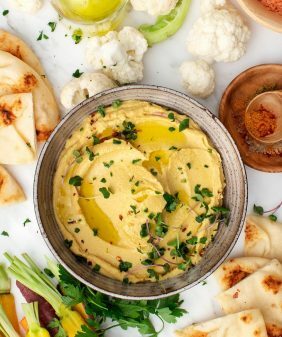 Love your recipes and beautiful photos! The current set up of our apartment makes it really difficult to have the UK equivalent of a CSA box which is really frustrating because I used to love the inspiration of a weekly delivery. This little wraps are exactly the kind of thing I like and it sounds like a perfect combination of flavours and textures. oh I know, finding a place for that box is a pain (even living in a bigger space). I kept tripping over it in my pantry until I found a better spot. But then I always forget to leave it out and I end up with 2. While I fell in love with my CSA in Illinois, I can’t wait to see what kind of produce I can get through one in California! Love the color and flavors in these wraps! Sooooooo all about this. HOLY gosh. Wow, this website is incredible! I absolutely love your pictures and your recipes! I have been looking for CSA’s near me for the past hour now! What an awesome idea. Seriously cool!! 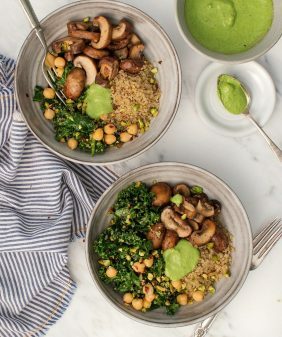 Love the simplicity and sheer cuteness of this dish! Whoever says salads are boring needs to visit your site missy! These are adorable! Thanks for the link to the CSAs – I’ve been wanting to join one for awhile now, but didn’t know of any close by. I want to experiment with different vegetables and I think this would be a great way to do that. Made these last night, super yummy and fresh! Thanks! Made these for dinner, they were good. Loved the basil parsley oil.